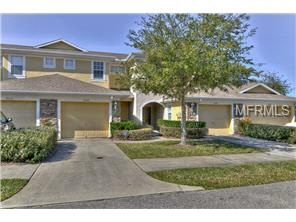 CAREFREE LIVING awaits you in this spacious and elegant 2 bedroom, 2.5 bath, 1 Car Garage maintenance-free townhome. Generous floor plan with 1278 square feet of living space. Kitchen features 30" Walnut cabinets, Corian counter tops, double stainless steel sink, snack bar, & built in desk. Living room and Dining room have beautiful view of the pond. Upstairs the bedrooms are separated by a loft. Master suite offers a vast walk-in closet and great view. The master vanity is spacious and has a walk-in shower. Covered lanai offers a beautiful view of the pond. The community's architecture features earthy tones and textures that subtly complement the surrounding natural habitat. Extremely peaceful and a definite must see. Stone Creek is a wonderful community within walking distance to A- rated elementary school and recreation facilities. Located in the heart of New Tampa and just a few minutes to I-75, Wiregrass mall, and many other shopping and dining options.